The Soyuz-2.1b carrier rocket with a military satellite has been successfully launched from the Plesetsk cosmodrome (in Russia’s north-western Arkhangelsk region), the Russian Defense Ministry press service told TASS on Tuesday. "At 09:34, Moscow time, a combat crew of the Aerospace Forces successfully launched from launching unit No 4 of site No 43 of the Plesetsk state test cosmodrome the Soyuz-2.1b medium class carrier rocket with the new generation spacecraft in the interests of the Russian Defense Ministry," the ministry reported. According to a defense official, the cosmodrome launch was carried out under the command of Deputy Commander of the Aerospace Forces - Commander of the Space Troops Alexander Golovko. 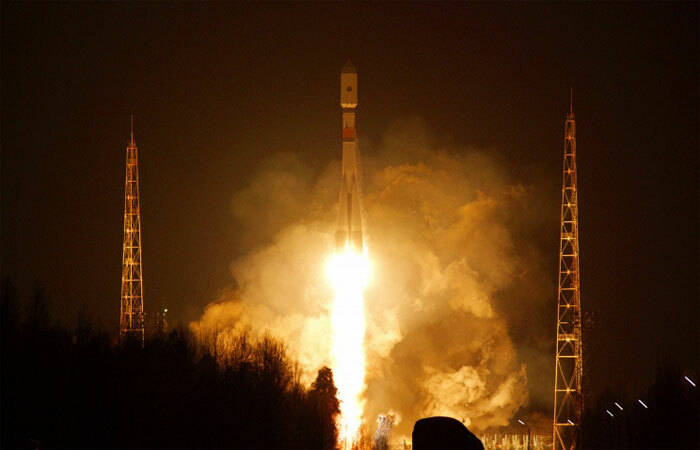 It has been the fourth launch of the Soyuz-2 carrier rocket from the Plesetsk spaceport in 2015. The previous launch from the northern cosmodrome was carried out on June 23, 2015. Also, two Rokot rockets were launched from Plesetsk in 2015. Flight tests of the Soyuz-2 space rocket complex began at Plesetsk in November 8, 2004. Since then, 23 launches of the Soyuz-2 carrier rockets have been made from the cosmodrome. Ground facilities of the Titov Main Test and Space Systems Control Center of the Space Troops of Russia’s Aerospace Forces are tracking the flight of the Soyuz-2.1b carrier rocket with a military spacecraft that was launched from the Plesetsk spaceport (in Russia’s north-western Arkhangelsk region), the press service of the Russian Defense Ministry told TASS on Tuesday. "At 09:36, Moscow time, the Soyuz-2.1b space rocket’s tracking was started by the ground-based facilities of the Titov Main Test and Space Systems Control Centre," the Defense Ministry said. The press service added that that all pre-launch operations and the rocket launch were carried out in a normal mode.